Virginia went from cradle of presidents to political backwater in a couple of generations—mostly for reasons of its own making, argues Dunn (Humanities/Williams College; George Washington, 2004, etc.). 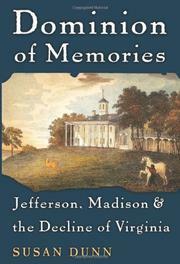 Jefferson’s death in 1826 coincided with the “sunset of the Virginia dynasty,” writes Dunn. Hitherto, Virginia had provided four of the first five presidents and much of the early judiciary; afterward, Virginia would supply only one president, John Tyler, and two justices, Lewis Powell and Peter Daniel. The reversal of fortunes owes to many factors, by Dunn’s account. One was the state’s “population of slumbering citizens, demoralized and passive,” bullied by property requirements and custom to leave politics to the landed aristocracy; another was illiteracy, four times higher than in states to the north, since “wealthy Virginians, historically averse to taxation, refused to support public schools.” Jefferson’s granddaughter, Ellen Coolidge, rightly remarked that for the state to prosper it required good soil and intelligent farmers, good citizens willing to support roads and schools and other amenities, a diversified economy, bustling cities and widely shared ideals of freedom and equality. Yet hidebound social traditions met political and economic reaction to produce resistance to change, such as breaking away from a tobacco economy, abandoning slavery and investing in industrial expansion. In the early republic, Virginia had no cities of note, no means to support the textile industry that it could have developed; had the state not cut off funding for geological surveys, Virginia explorers might have discovered its stores of “coal, gold, iron, copper, lead, and even salt” and yielded wealth that way. (One of the state surveyors left in disgust and, as Dunn notes, founded MIT.) Irrelevant to the nation’s progress, Virginians came to embrace a wounded sense of state’s rights, still led by a gentry that subscribed to the view that “good government was simply government of, by, and for themselves and their interests.” And so it would long remain. A lucid, provocative work of historical inquiry, though unlikely to win any praise among the First Families of Virginia.